Some dog breeds have a natural propensity to bite. A pit bull terrier, Akita, Doberman Pinscher, Chow Chow, Rottweiler or Alaskan Malamute may be, by that definition alone, a vicious dog. These breeds are responsible for a large number of attacks and some of the most vicious maulings. Many communities have statutes limiting the right to keep a dangerous animal. If you or your child was attacked by a dog or other domestic animal, it is important to get legal advice quickly after the attack, so the animal can be dealt with and your lawyer can build a strong case on your behalf. If you would like to speak to an attorney from our firm, The Law Offices of John F. Marshall, please contact our office to arrange a free and confidential consultation. Under the New Jersey Vicious and Dangerous Dog Act, any dog with a history of aggressive behavior is considered a vicious dog. After a dog has bitten the owner is required to take extra measures, including a muzzle, a cage, and a stronger fence to protect the public, or the dog will be taken by animal control. If the dog bites a second time, it will be put to death. If you were bit by a dog, you are automatically entitled to compensation from the dog’s owner for your medical expenses, lost wages, trauma and pain and suffering under the New Jersey dog bite law. 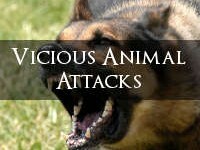 If the dog (or cat, bird, horse, or other domestic animal) that attacked you has a history of aggressive behavior or biting, you may be entitled to an additional lawsuit against the animal’s owner or handler for negligence. If you or a member of your family was injured by a vicious dog or other animal, it is important to have a lawyer with experience in similar cases review your claim. Protect your right to recover full compensation for your loss. Call 1-877-450-8301 or e-mail our Shrewsbury office to arrange a free consultation with an experienced personal injury attorney.